This is a rental house I live in - an attached garage was added some time after the house was built (house was built in 1918, garage is substantially newer). 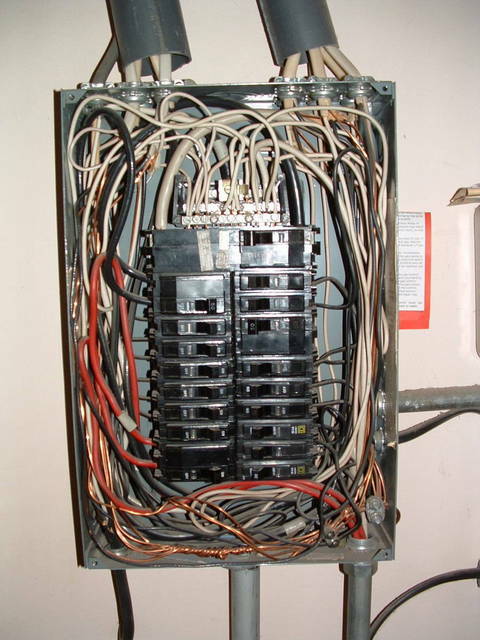 The electrical service was very recently (last few years) "upgraded", see below. 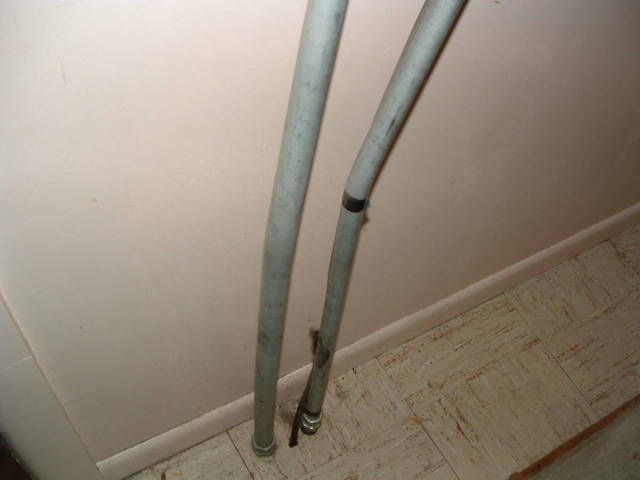 Picture 1: Two pieces of PVC pipe, split longways, to slide over the conductors. I have no idea what the timer on the right does or the red indicator with it's unprotected cable being taped to the side of one of the metal raceways and going into the crawlspace and the other one that goes to an outdoor receptacle in the garage (other side of wall). Note lack of working space as well. 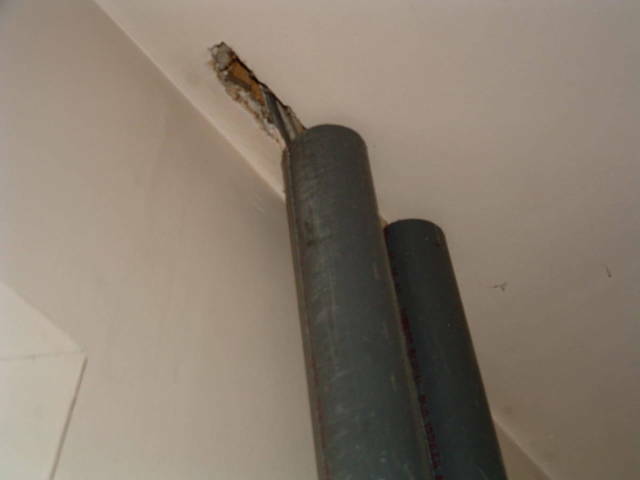 Picture 2: Detail showing how the cable taped to the conduit makes it through the floor. Picture 3 showing the meter, still active. The service dropo goes upward - it's the original service drop. Note the shingles on the roof of the "house", visible here. Note the cables in the rafters - they are stapled in place, but I'm questioning whether this is proper protection when the rafters are also used for storing building materials. The power company knows this meter is here - I told them they couldn't get to the meter if I'm not home, and they were fine with it - just gave me a stack of paper cards to record the readings myself, and asked that the meter reader be allowed in to take an initial reading. 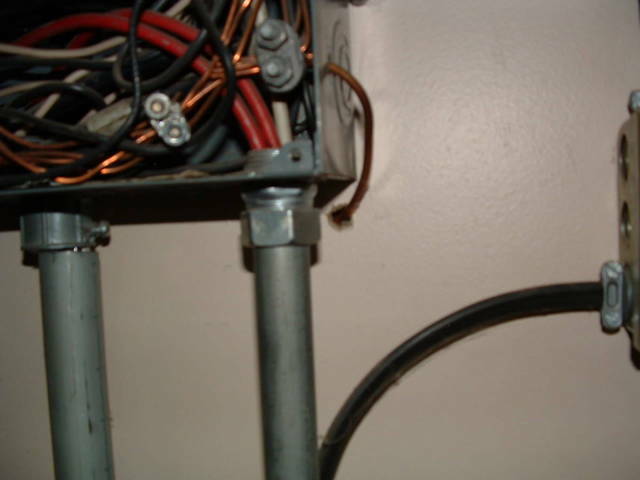 Picture 4: The old grounding wiring, just dangling. 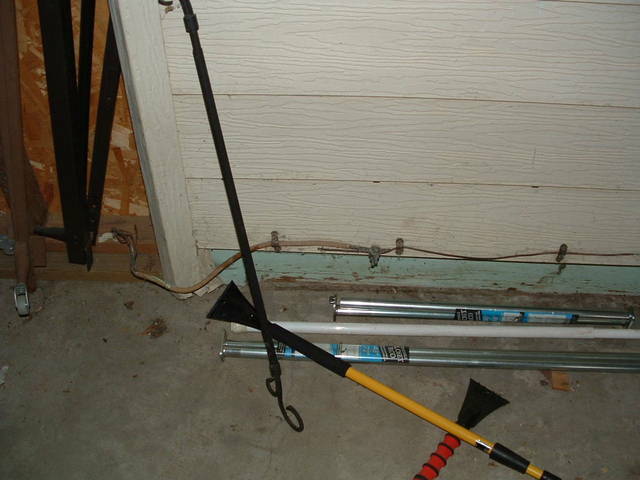 I'm guessing there used to be a grounding rod somewhere around here, but it was in the way of the garage. There was no grounding rod directly under the meter. 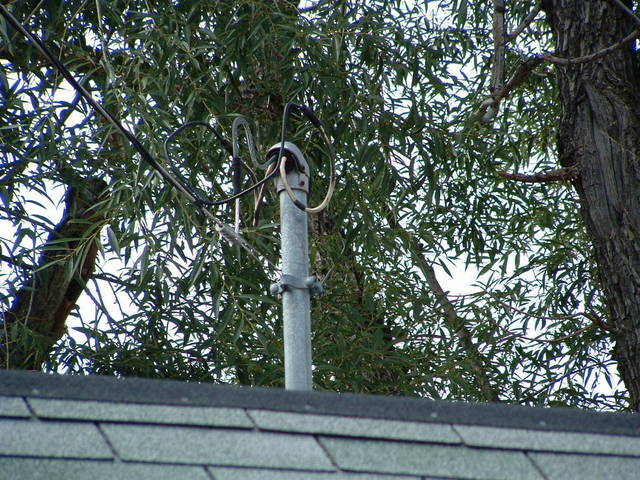 It might look like the meter pan is connected to the wire that drops down and branches this way, but fear not - only the panel is connected. The wire comes through a small hole in the wall next to the meter. Picture 6: The service drop. You might not be able to tell from this completely, but it is clearly visible from outside the house that it ends in the middle of the roof. Picture 7 - More detail of the creative conduit design from the panel going into the attic. Picture 8: This is how the panel is grounded. As far as I can tell, the drilled hole in the side of the panel is how the panel enclosure is bonded. Note the slightly-too-short conduit on the left. No problem, though - no need to maintain bonding in this install! Disclaimer: I'm not an electrician, I'm in telecom, and this house's telephone wiring is just as bad - just not as likely to kill someone... I'll send some telecom/data violations I've seen in the field sometime later (my favorite, thus far, is the router at a site with a sign on it, "Don't touch - you'll get zapped" complete with skull and crossbones; Someone dropped it, bent the power supply inside so that the ground broke inside and the hot wire contacted the case - the case was hot - and they never thought it worth reporting for replacement). No sooner do I post an "expert" panel example ... and this comes along! Attention, Hacks: We are NOT having a contest! I'm not crazy about that white or gray hot leg on the left side of the main breaker. I'm also curious as to how those feeders enter the panel. (It is hard to tell). As for the ground wire entering the hole on the right side of the panel, that's just a screw/nail hole knockout for flush mounting of the panel. Trust me, they didn't get that creative and actually drill a hole. As for the telephone protector ground, more ground rods is not good. 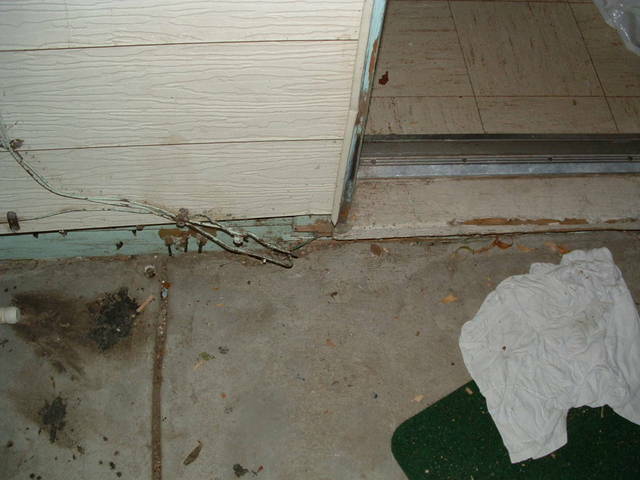 Unless all of them are bonded together, separate ground rods actually invite problems. It was actually better that they ran the protector ground to the known electric service grounding electrode. I'll admit that it sure could have been done a lot more neatly, but it's really not wrong. I was the original poster on this - as for the telco ground, certainly they shouldn't drive one (I wouldn't trust the telco to bond it right), and they should tie into the existing system - they did that fine. But as far as I can tell, the existing ground rod must have been in an inconvenient place and was just covered over (with the ground wire disconnected). There is no grounding to anything as far as I can tell - no grounding to water pipes, no grounding to ground rods, etc. Good catch on the white wire on the left side - I didn't notice that. The sad thing is that this owner was bragging about "upgraded electric, how it's very modern and safe, and all the old unsafe wiring was removed". I doubt the owner realizes it is unsafe - I think someone just gave her a "good deal" on electrical. I think she tried to do the right thing and make the wiring better by hiring someone. She just hired the wrong person. With that being said, it appears that her wiring went from unsafe to......Well, let's just say more unsafe. I might also add, that Square D panel design hasn't been made in years. She got nothing new, that is for sure. My best guess would be that the main conductors enter the panel through conduit at the bottom center of the panel, and then take that convoluted path to the top. That conduit looks like the only one large enough (?) to handle those wires - the one to the right is already crammed full. What the heck...who cares about wire fill anyway. This panel looks like the way I feel after eating dinner on Thanksgiving Day...STUFFED! It looks to me like the service comes in thru a hole or conduit on the rear of the can, lower left, just behind the conuit with the red wires. Mike, I don't think that the service entrance conductors are in that 1" EMT. My guess would be that it contains the two #6 blacks and hopefully a white (perhaps for a range circuit) and the two reds in the 3/4" maybe are for a dryer circuit. I'm in agreement that the service is back-to-back with the meter from the lower-right corner. Those look like 1/0 conductors to me, but I suppose that they could be old #2 THW (that insulation was mighty thick). 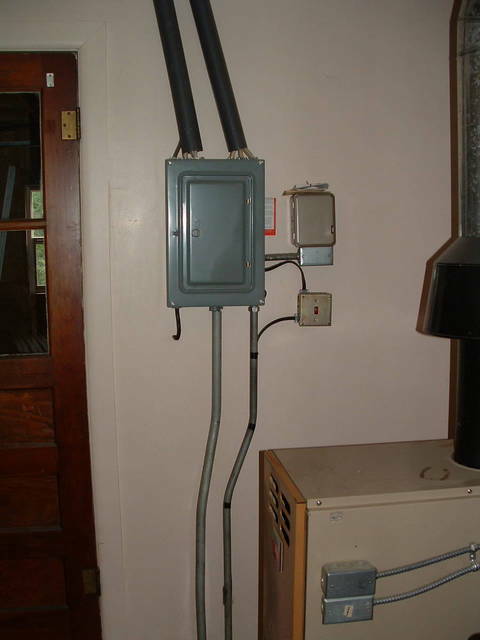 Since there is a gas boiler in the picture, perhaps the abandoned two-pole breaker on the right side of the panel originally fed an electric water heater that was replaced with a gas one at some point along the way. I think that the timer is also abandoned and may have been used for the original electric water heater for energy savings. I think that the Romex and the box with the red light may have been an indicator to let them know when the power was turned on for the water heater. People used to panic when the water heater was on back in the 1970's. My guess is that the house originally had an oil boiler until the 1960's when it was replaced with a gas one. That draft hood on the flue dates it to about that time frame. I'd say that the original oil boiler also provided hot water through a tankless coil; something not common with gas boilers. It does concern me that not one single ground wire is connected to the neutral bar, indicative of an installation that has been wrong since it was originally installed. This whole job looks to be early 1970's era based upon the overall materials used. Joel did say that the mast arises through the middle of the roof, so my guess is that the meter was originally on the back of the house and there is now a screened porch containing it. Are we getting close, Joel? Last edited by EV607797; 09/18/08 08:11 PM. Reason: More guesses. The service entrance is in the back of the panel, lower right - it's back-to-back with the meter. I looked again at the panel, and found an inspection tag (!) in the bottom of the panel, for "meter inspection" with a date in 1995, passed (!). The panel appears to have been initially installed in 1978 however, according to a note inside that I also discovered. The inspection tag had wire to tie it to something - this 6 inch long piece of bare wire was just tangled amongst the other wire in the panel (!). I didn't dare remove it without shutting off the main breaker first. I should have snapped a picture - I don't know if anyone would expect the *inspection tag* to be a violation. What probably won't surprise anyone is that the contractor as indicated on the tag is "homeowner". So, definitely wasn't anyone with actual credentials showing their qualifications - I'm guessing the permit was in the homeowner's name, but done by a handyman. 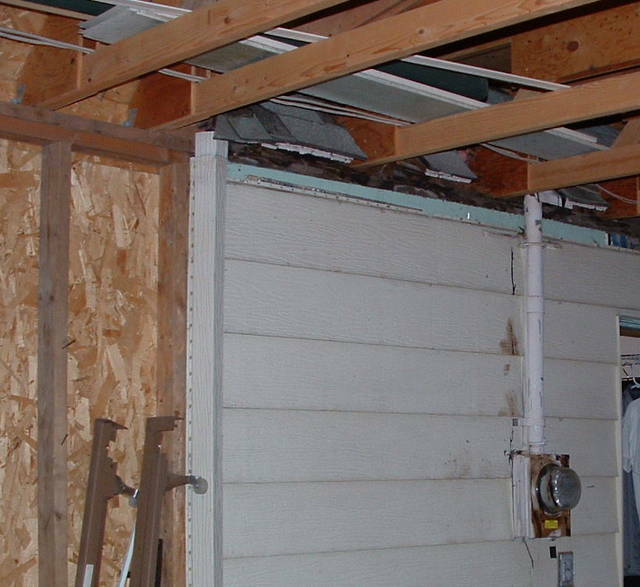 The meter isn't in a porch, it's inside a garage that was added onto the house. The scary part: they built a roof for the garage with the service just hanging there - I'm sure they didn't have the utility disconnect anything when they were lifting and placing roof joists, having to crawl *under* the utility's wire which is no more than 4 foot above the roof for most of the roof. This might be the best argument for creationism over evolution out there - the fittest weren't the only ones that survived! As for the water heater, I think you're right - that's been redone a few times I think. Sometime in the past, this whole room was added onto the house. In 1912 when built, it had no plumbing, and this room was where the plumbing was later added in, and likely the boiler too (it was originally heated by wood stove). Tell the owners to send me those asbestos tiles when they rip them up, I have to replace a few broken ones! OK, total mess, romex, PVC, EMT all of it. Looks like another one that would call for a total rip-out and replace, or at least the service!